Buy Granovita Gourmet Pate - Mushroom 125g in the UK from our online shop or directly from our independent Scottish store. A delicious gourmet vegetarian organic tofu pate made with mushrooms and herbs. Vegetarian and Vegan alternative to meat pate. Water, non-hydrogenated palm fat+, mushrooms (15.6%), nutritional yeast (12.8%), potato powder, onions, sea salt, yeast extract (0.4%), spices (paprika, nutmeg, hot paprika), herbs (thyme) garlic. We sell real Granovita and other Vegetarian Pate directly from our shop in Scotland and online throughout the UK. View more products from Granovita. Where can you buy real Granovita Mushroom Pate safely online? 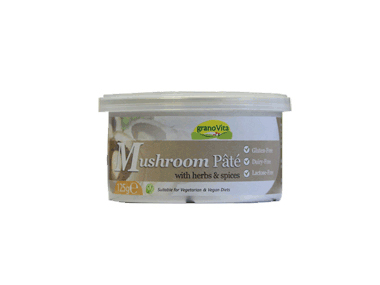 If you are wondering where you can buy Granovita Gourmet Pate - Mushroom 125g safely online in the UK, then shop with us. We are an actual health foods shop; with real people selling real foods and products. Our award-winning independent shop is located in Stirling, Scotland since 1976. You can buy our Vegetarian Pate in store or safely place an order with us online or over the phone. Granovita Mushroom Pate - Granovita Gourmet Pate - Mushroom 125g in Vegetarian Pate and Honeys, Jams & Spreads.